In January 1978 a resolution #17 of Council of Ministers, and in February the same year a decree #60 of Ministry of the Aircraft Industry on development of an anti-ship missile Kh-31A, derived from Kh-31, were passed. The new missile intended to destroy surface ships with displacement of up to 4500 t, was equipped with an active radar guidance system and penetrating warhead. On August 7, 1978 Kaliningrad design and production enterprise "Strela" was renamed into Kaliningrad production association "Strela". - possibility to upgrade this type of tactical weaponry, equipping it with new types of warheads and guidance systems. The development of a modular missile Kh-25M had to make it possible to decrease the number of "air-to-surface" missile types, reduce expenses and the time, taken for the development of new missile models, raise their reliability and make missiles' operation easier. Kh-25MR - multi-purpose missile with radar guidance system. Beside production of missiles of its own development, Kaliningrad production association "Strela" also fulfilled state orders on missile manufacturing. In this context, in 1979 the enterprise had to manufacture a new generation of R-33 missiles, developed by the State Engineering Design Bureau "Vimpel". 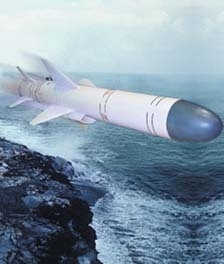 Despite designing and manufacturing approach, developed according to the other design experience, the enterprise produced the required batch of missiles. In 1977 the consumer products' range was increased; the enterprise manufactured "Kadet", "Kort", "Kort-2" and "Ramten" tennis rackets for children and grown-ups as well as "Lastochka", "Lastochka-2", "Lastochka-3" and "Solnishko" badminton rackets. Their output amounted to 120 thousand units a year. 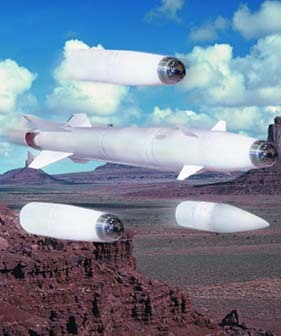 In 1980s the enterprise developed and manufactured tactical missiles of both classic and modular types, target missiles, missile systems and consumer goods. According to the good results of the tests Council of Ministers passed a decree of September 2, 1980 under which anti-radar missile Kh-27 was put into service with the Air Forces. In January 1980 the flying tests of a target missile Its-59V "Magnit", which was an updated variant of Its-59 "Olen" started. The Its-59V had higher altitude and increased launch weight. 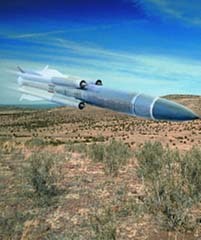 The Experimental& Design Bureau also developed next generation of target missiles - M-31, MA-31, ITs-35. On September 16, 1981 the Presidium of the USSR Supreme Soviet passed a decree on decoration of Kaliningrad production association "Strela" with the Order of the Red Banner of Labor for its contribution to strengthening defensive capability of the country. In 1981 the state tests of KH-25M modular missile were finished, after which it was pit into service. Its serial production began in 1982. 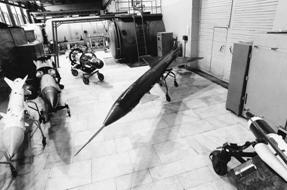 In May 1981 specialists started flying tests of anti-radar supersonic missile Kh-31P. In March 1983 Victor G. Galushko was appointed chief designer. On March 16, 1983 the Russian government passed resolution on experimental and designing works to produce shipborne missile system «Uran» with anti-ship missile KH-35. To test the system under real sea conditions, a firing range, which was a subsidiary of "Strela», was founded at the Black sea shore, near Feodosiya. Having received the good results of tests, Kaliningrad production association "Strela" started serial production of Kh-31P missile. On November 5, 1985 the first stage of preliminary Kh-35 missile tests began, which was completed in 1987. In 1986 Georgii I. Khohlov was appointed chief designer, and in January 1987 Vjacheslav A. Shapovalov was appointed director general of Kaliningrad production association "Strela". That time flying-and-designing tests of "Uran-E" missile system started. The state tests of the Kh-31P completed in 1988, and in a year - the state tests of anti-ship supersonic missile KH-31A on Su-24M warplane, after which its serial production was mastered. Besides, 1989 saw the flying tests of M-31 target missile. At the same time the second stage of flying tests of the Kh-35 was completed. The enterprise fulfilled an order on Luneberg lens manufacturing. The Experimental Design Bureau was reorganized into Experimental Design Bureau "Zvezda» through incorporation of the legal entity. Consumer goods production was rapidly expanded. In 1985 a "Complex program on development of consumer goods production (1986-2000)" was drawn up to increase production several times during this period. Tea and coffee sets production exceeded 50 thousand units a year. In 1990s Kaliningrad production association «Strela», as well as the whole country, experienced hard times of transition from the planned economy to private enterprises. Despite the defensive nature of the manufacturing products, the enterprise started mastering market economy methods. Having withdrawn military force from Afghanistan, the government of the country changed its policy concerning defense field, that consisted in reasonable reduction in expenditure on weaponry manufacturing and the number of middle- and small range missiles. Under conditions of a considerable cut of the state order, the enterprise set up relation with foreign partners, analyzed the world tactical weaponry market. In 1990 Nikolai S. Zhuchkov was appointed director general and Sergei P. Jakovlev took post of a head engineer. In summer 1992 the association took part in the first Russian international aerospace exhibition "Mosaeroshow" (later Moscow aerospace salon - "MAKS"). It was the first successful experience of the enterprise, after which military equipment, manufactured by the enterprise was exhibited on other international exhibitions. On December 6, 1992 Kaliningrad production association «Strela» was renamed into federal state unitary enterprise Kaliningrad engineering plant «Strela». Beside the works on war missiles' development, the enterprise actively worked on development of target missiles. In 1993 the specialists started working on MA-31 model, a quite new generation of missiles with a considerably expanded characteristics. In 1996 the missile was launched for the first time in Russia the USA, where the MA-31 was exported under the contract. In 1994 Sergei P. Yakovlev was appointed director general of the enterprise, Ivan D. Teslya took the post of a head engineer. This year the state tests of Its-35 01 target missile were successfully completed and the first contract on delivery of Kh-35 missile for the shipborne missile system "Uran-E" was signed. On March 13, 2003 the legal execution of reorganization and transformation of the Federal State Unitary Enterprise “Zvezda-Strela” SRPC into Tactical Missiles Corporation JSC was completed. Boris V. Obnosov was appointed director general, Alexander P. Pastarnak - head engineer and Alexei I. Belskih took the post of chief designer.